Beginning Wednesday, July 25, two special event call signs will be activated to celebrate the London 2012 Olympic and Paralympic Games: 2O12L from London, England and 2O12W from Barry, Wales. Both stations will be on the air for the duration of the Games -- July 25-August 12 -- and continuing through September 9. Organizers hope to make at least 80,000 contacts during the seven weeks that 2O12L and 2O12W are on the air. •The London station – 2O12L -- will be active on 160-2 meters on all modes. The station is located at the Royal Greenwich District Scouts Activity Centre in Southeast London, in the borough of Greenwich, one of the six “host boroughs” for the Games. A list of planned frequencies is available here. The station will be open to the public from 10 AM to 4 PM each day, and visitors may operate. Follow 2O12L on Twitter. •The Welsh station -- 2O12W -- will be active on 160 meters-23 cm on all modes, including SSTV and satellite, will be based on the seafront esplanade at Whitmore Beach, Barry Island, Vale of Glamorgan. The site is located just a few miles south west of Cardiff and the Millennium Stadium, home to the first football match that will open the Games in Wales. The station will be open to visitors. Follow 2O12W on Twitter. With the 'London 2012 Olympics' official opening taking place this week, this is a reminder of the previously posted information about the 'Amateur Radio Flagship Event Stations' that will be operating beginning Wednesday July 25 until the Games close on September 9. The London station 2O12L (two-oscar-one-two-London) and the station in Wales (two-oscar-one-two-Wales) will be operating on amateur HF and VHF/UHF bands during the event. The Barry Amateur Radio Society in Wales, subject to operator availability and suitable passes, will endeavor to make contacts via the amateur radio satellites as well, of course, as the HF bands. London has a restriction imposed on VHF/UHF activation which will limit personal operations on the satellites. Outside the restricted zone however there maybe other amateur radio operators who may be active, not as "flagship stations" but using a personal or club call sign under a notice of variation. Barry Amateur Radio Society in Wales looks forward to making as many contacts as possible for this rare opportunity. We take this as an opportunity to wish all those participating in the Olympic Games and amateur radio operators world wide "Good Luck". В честь Олимпийских Игр и Паролимпийских Игр 2012,которые состоятся в Лондоне, британские радиолюбители получили специальные временные позывные на период с 00:00 2012-07-21 до 23:59 2012-09-09 по британскому летнему времени (GMT+1). 2D, 2E, 2G, 2I, 2J, 2M, 2U, 2W используют 2O префикс. G, GD, GI, GJ, GM, GU, GW используют GO префикс. M, MD, MI, MJ, MM, MU, MW используют MO префикс. 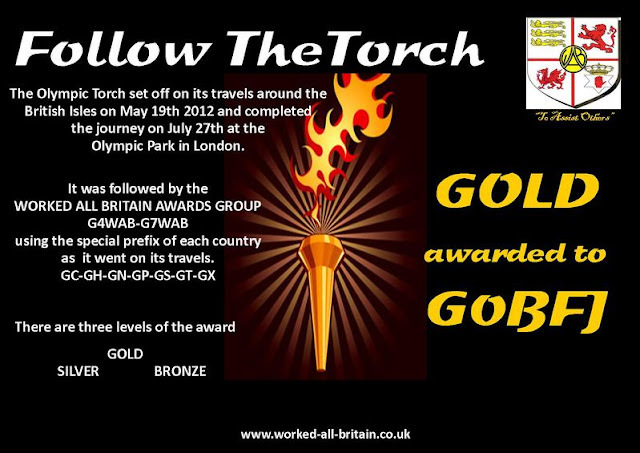 WARRINGTON Amateur Radio Club (WARC) have been granted a licence to cover both the 2012 Olympic and Paralympic games. In a collaborative effort with West Manchester Radio Club and South Manchester Radio and Computing Club, WARC have been granted the special call sign GB2012MV (Manchester Venue) for the event at Old Trafford, home of Manchester United, one of the venues for the Olympic football tournament. A spokesman for WARC said: “This is going to be a massive effort by a dedicated group of north west amateur radio enthusiasts, operating from three venues across the region, Warrington and two in Manchester.